Palestine and The Arab World lost an eminent academic scholar, an internationally recognized and highly respected intellectual, a committed and unwavering Palestinian patriot and a progressive Arab nationalist. 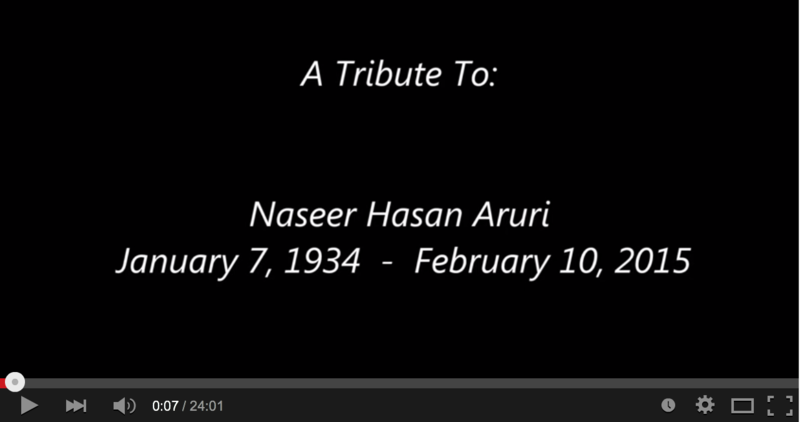 Dr. Naseer Aruri passed away on February 10th, 2015. Dr. Aruri was a leading voice in the field of human rights and an authoritative reference on US foreign policy in the Middle East, particularly towards the Palestine/Israel conflict. Born in 1934 in Jerusalem, Palestine, Dr. Aruri held a Ph.D. in Political Science from the University of Massachusetts-Amherst, and was a prolific writer and lecturer who appeared often in the media throughout the past half century. Dr. Aruri served on the faculty of the University of Massachusetts - Dartmouth from 1965 to 1998 and, at the time of his retirement, was Chancellor Professor of Political Science at that university. This life of academic excellence was matched by a prolific activist career dedicated to the service of Palestinian and Arab causes. As a member of the Palestinian National Council, the Palestinian’s Parliament in exile, and the Central Council of the PLO, he was widely known and admired by Palestinians everywhere for his vast knowledge, complete dedication, and unmatched honesty. He was keen on building and strengthening Palestinian, Arab and Arab-American institutions. Dr. Aruri was a founder and two times President of the Association of Arab-American University Graduates, which was the first Pan-Arab organization in North America when it was established in 1968 and had the largest membership of Arab academics outside the Arab World. In 1998, he co-founded Trans-Arab Research Institute (Boston), and served as Chair of its Board of Directors until 2006. Dr. Aruri dedicated himself to the support of human rights. He was a member of the Independent Palestinian Commission for the Protection of Citizens Rights (Ramallah) since its inception in January l994; a founding member of the Arab Organization for Human Rights in 1982, and a key participant in the drafting of the Arab Covenant of Human Rights in December 1986. He was also a member of the Board of Directors of Human Rights Watch/Middle East, 1990-1992, and a three-term member of the Board of Directors of Amnesty International, USA (1984-1990). Dr. Aruri served on the boards of Third World Quarterly (London), the Jerusalem Fund - Palestine Center (Washington, D.C.), and the International Institute for Criminal Investigations (The Hague). In his struggle on behalf of Palestine and the Palestinians, the lifetime aim of Dr. Aruri was to promote a solution to the Palestine/ Israel conflict based on the establishment of one democratic state in historic Palestine in which all its citizenry, regardless of their ethnicity or faith, are free and equal. Dr. Aruri’s many publications include The Palestinian Resistance to Israeli Occupation (1970), Enemy of the Sun: Poems of Palestinian Resistance, with Edmund Ghareeb (1970), Occupation: Israel Over Palestine (1983), The Obstruction of Peace: The U.S., Israel and the Palestinians (1995), Palestinian Refugees: The Right of Return (2001), Dishonest Broker: The U.S. Role in Israel and Palestine (2003), co-author with Samih Farsoun of Palestine and the Palestinians: A Social and Political History (2006) and Bitter Legacy: The United States in the Middle East (2014). The private library and papers of Naseer Aruri have been preserved and are on display at the Claire T. Carney Library Archives and Special Collections at UMASS-Dartmouth. Dr. Aruri is survived by his wife Joyce and four children; Faris, Karen Leila, Jamal and Jay Hatem and their spouses and 13 grandchildren.